"I've always lived my life exactly as I wanted. I've tried to please no one but me, me, me�and very likely displeased a great number of other people in the process. But I'm entirely content. I can sit back in my old age and not regret a single moment." Only a star of Katharine Hepburn's magnitude could snag top billing for a minor supporting role, and top billing is exactly what Katharine the Great receives in One Christmas, a made-for-TV drama based on Truman Capote's short story. And though the 87-year-old Hepburn more closely resembles a doddering grandmother than a legendary actress in her screen swansong, she still possesses plenty of crusty Yankee resolve. Never mind that she plays an imperious Southern dowager, or that her screen time totals a measly 12 minutes�she's worth the price of admission nonetheless. One Christmas is less about Christmas than it is about an estranged father and son, and their rocky road to mutual acceptance and reconciliation. The holidays provide an atmospheric backdrop and help emphasize the messages of love, redemption, and forgiveness on which Hallmark films subsist, but Christmas never steals the focus like we hope and expect it will (especially given the film's title). The story treatment is typically syrupy, but the all-around fine acting makes One Christmas a bit more palatable than similar seasonal mush. T.J. Lowther portrays Buddy, a young boy who lives a sheltered life in rural 1930 Alabama with his elderly cousin Sook (Julie Harris). When Sook must travel up north to care for a sick relative (whom we later learn is Buddy's mother), Buddy is shuttled off to New Orleans to meet the father (Henry Winkler) who deserted him at birth. Both father and son are disillusioned with each other�Buddy's dad sees his son as a sissy, while Buddy is shocked at his father's lying and cheating ways�and look forward to the end of their holiday purgatory and a return to their everyday lives. Never having performed an honest day's work, Buddy's dad relies on his fast-talking wiles and Southern charm to bankroll his lifestyle. He spends his days masterminding scams and wagers, and his current swindle involves convincing society matrons to invest in an airplane race. A particularly lucrative catch is Emily Beaumont (Swoosie Kurtz), a rich spinster who's always been smitten with Buddy's dad over the objections of her sourpuss Aunt Cornelia (Hepburn). After Emily relinquishes her heart and several hundred dollars, Buddy's father endures a run of bad luck. Faced with ruin, he begins to see the true value of human relationships, and he and Buddy grow closer. Director Tony Bill evokes a festive period feel and draws natural, affecting performances from his cast. Winkler especially impresses with his uncompromising and largely unlikable portrayal. With admirable restraint, he resists the temptation to cross the line into maudlin sentimentality, thus managing to salvage the film's contrived last act while still transmitting the required sensitivity. As the cantankerous Cornelia, Hepburn mostly barks at people (which is fun to watch, if you can handle her violent tremors), but she does enjoy a couple of tender scenes toward the end, and the contrast is effective. If you're looking for something to infuse your family with holiday spirit, you better bypass One Christmas. The harsh characters, sluggish plot, and balmy New Orleans setting do little to promote seasonal cheer, and although the ultimate message is warm and uplifting, plenty of other Christmas movies preach much the same gospel with a lighter touch and more festive flair. Image Transfer Review: The full-frame presentation remains bright and clean throughout, but possesses little luster. Only a few specks intrude, but the image quality never rises above made-for-TV status. Audio Transfer Review: The Dolby Surround track exhibits an annoying and far too consistent rumble that's especially noticeable during interior scenes. Adding insult to injury, dialogue is also muffled much of the time. Here is a rare case of audio enhancement gone terribly wrong, and this disappointing soundtrack only adds to the film's problems. Extras Review: Nothing except a paltry 12 chapter stops. 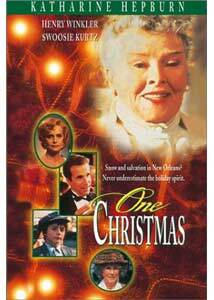 Fans of Katharine Hepburn will welcome the DVD release of One Christmas, but they're the only ones. Despite some good performances, this Truman Capote adaptation drags its feet to its predictable and not altogether satisfying conclusion. It's easy to cherish Hepburn in her final film role, but she appears far too sporadically to save the day.